Let’s begin by discussing the chemistries used for silicon. Both epitaxial and polycrystalline silicon can be deposited using chemical vapor deposition. Silicon is deposited using silane or a chlorosilane gas. Both gases are highly reactive and must be treated carefully. Both gases produce excellent step coverage and good gap fill properties. 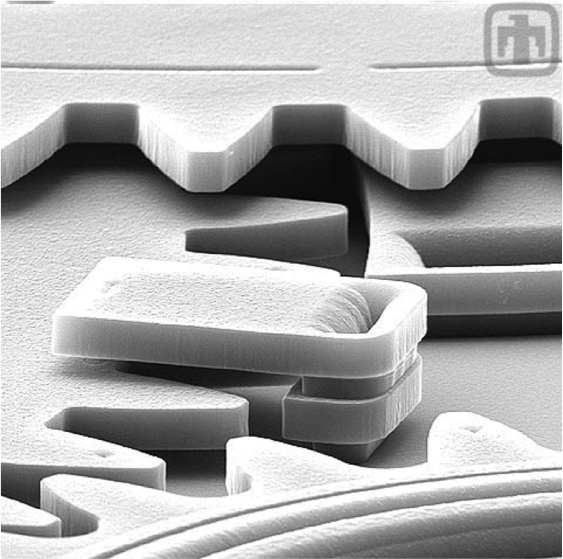 These properties, while not as important in today’s world of chemical mechanical planarization, are very worthwhile in the fabrication of surface micromachined structures, like the one shown on the right. Polysilicon is formed by the thermal decomposition of silane. It is deposited by low pressure CVD. It is normally done at temperatures between 580 and 650°C. Below 580°C the polysilicon film is amorphous. Amorphous polysilicon tends to have higher resistance. Above 650°C, the grains are large, but the film becomes rough and does not adhere well to the gate oxide regions. There are two common chemistries for depositing CVD silicon oxide. 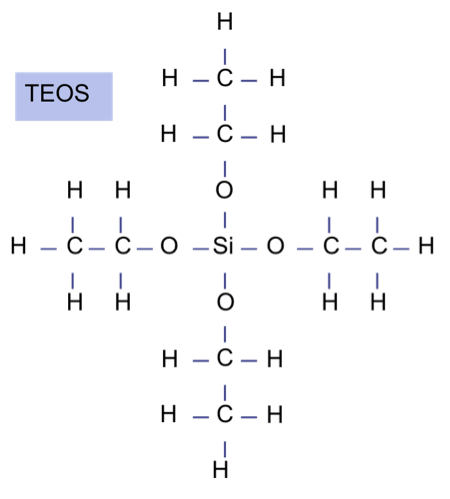 One is silane-based while the other is TEOS-based. While silane plus oxygen will produce silicon dioxide, it is very reactive and causes gas-phase reactions. The temperatures associated with this reaction also result in poor step coverage and “bread-loafing”. These effects can be reduced somewhat by using plasma enhanced CVD. TEOS (pronounced tee-os) or tetra-ethyl-ortho-silicate is very commonly used for depositing silicon dioxide. It has the advantages of a single source precursor, which means no gas phase reactions. A purely thermal TEOS CVD reaction around 700°C will produce some bread-loafing, so plasma enhanced TEOS CVD is normally performed. There is some risk of carbon contamination when one uses TEOS. Process engineers use CVD when they cannot grow thermal silicon dioxide layers, which means they use this approach extensively. The process applications include interlevel and intermetal dielectrics, capping layers on materials like copper to prevent outdiffusion, ion implantation masks, and the final protective passivation layer on the chip. The properties between thermal silicon dioxide and CVD-deposited oxide differ substantially. We’ll discuss those differences on the following slide. Also, the deposition conditions control the properties of the oxide. The comments on the following slide apply to both low pressure CVD and plasma-enhanced CVD, unless we state otherwise. If we compare the qualities of thermally-growth silicon oxides to CVD-deposited oxides, we see there are several differences. Note that a thermally-grown oxide has a silicon to oxygen ratio of 2, whereas a CVD-deposited oxide is greater than 2. Thermal oxides have a higher density, lower etch rate, lower stress, higher dielectric strength and higher breakdown voltages. However, thermally-grown oxides can only be grown on silicon surfaces, and require extremely high temperatures, making them useful only in limited situations. One can produce an oxide with properties more similar to a thermal silicon dioxide by raising the temperature during the deposition. Another technique is to perform a thermal densification after deposition. Process engineers do this at temperatures between 700 and 1000°C. As such, this process cannot be used after depositing aluminum metal. There are three common chemistries for this approach: silane, tetraethyl orthosilicate or TEOS, and TEOS plus ozone. This is the chemical structure for TEOS. This table shows the three CVD deposition techniques for silicon oxide. In general silane provides a simple deposition method, but it is the most dangerous because silane gas is not only toxic, but highly explosive. It also suffers from problems with step coverage. 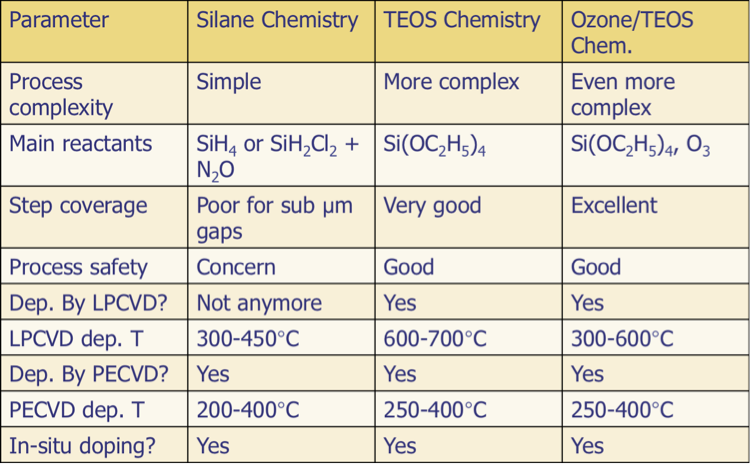 If we look at the chemistries in more detail, we see the reactions for silane, TEOS and ozone plus TEOS here. There are separate chemistries for TEOS depending on whether or not the reaction uses LPCVD or PECVD. The PECVD reaction requires the addition of oxygen to the reaction. LPCVD gives the best performance in terms of conformality, so it works well from trench fills like one needs for shallow trench isolation. In addition to silane and TEOS, there are a number of other possible precursor gases that one can use for PECVD-deposited oxides. There are three common types of doped oxides: phosphosilicate glass, borosilicate glass, and borophosphosilicate glass. Most process engineers use the acronyms PSG, BSG, and BPSG. The typical doping range is 1 to 4% by weight. The advantages of doped silicon dioxide include: lower stress, better step coverage, lower reflow temperatures, and the ability to getter contaminants. Reflowed glass layers can round sharp corners, creating a smoother surface topography, while PSG getters highly-mobile alkali metals like sodium and potassium. Process engineers can dope the film in-situ by adding dopant gases. These include phosphine or trimethylphosphite for n-type doping, and diborane or trimethylborate for p-type doping. An important application of PECVD is the deposition of silicon nitride. The specific applications include the formation of side wall spacers for transistors, the damascene etch stop layer, and the top passivation layer for the chip. We show the basic equation here. We react silane and ammonia to form a solid silicon hydrogen nitride on the chip. By using an RF plasma, we can lower the deposition temperature to between 200 and 400°C. Unfortunately, hydrogen content is a concern. At around 300°C, the hydrogen content can reach 20% or greater, which impacts film etching. 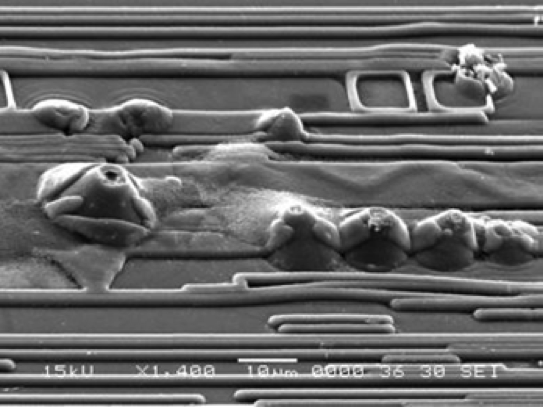 Also, the hydrogen content in the sidewall spacer can lead to transistor threshold voltage shifts. Overall, this results in a lower quality film, but it is also a lower stress film. Another major material group deposited by PECVD is the oxynitride group. The process applications for silicon oxynitrides include: the liner films for shallow trench isolation, the interlevel and intermetal dielectrics, the final passivation layer, the gate and capacitor dielectrics, and dielectric antireflective coatings. We show the basic equation here. 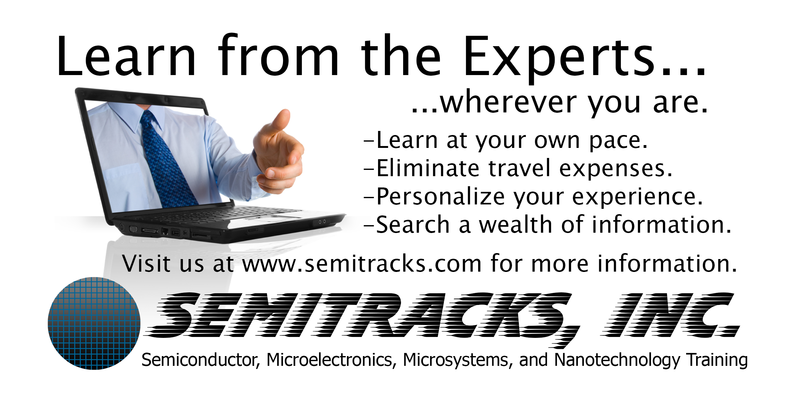 We react silane, ammonia, and nitrous oxide to form a solid silicon oxynitride layer on the chip. We can control the composition of this film by controlling the nitrous oxide flow. There are two main CVD chemistries for silicon nitride deposition: silane-ammonia and chlorosilane-ammonia. Silane plus ammonia is very reactive in a thermal CVD reaction. Essentially, the reaction rains silicon nitride particles on the wafer surface. The silane-ammonia chemistry has been used in plasma enhanced CVD reactions with moderate success. The chlorosilane-ammonia chemistry is a better choice for CVD silicon nitride. It is less reactive, and produces excellent step coverage in a thermal CVD reaction. The chlorosilane-ammonia chemistry produces a silicon-rich silicon nitride. This has the advantage of producing a lower stress nitride layer, which can help reduce problems with dislocations in the silicon. CVD silicon nitride is commonly used for masking the silicon for ion implantation, and creating the nitride spacer on the side of the polysilicon gate. Although DRAM architectures have not evolved significantly over the last 15 years, there have been some incremental developments in the front end of line processing to improve the transistors. 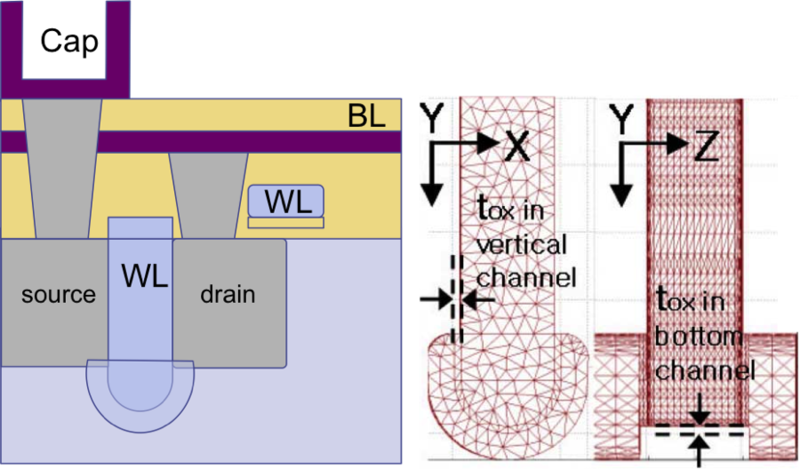 One such improvement is the saddle FinFET structure. The Saddle FinFET or S-Fin is a variant of the buried wordline architecture. In addition to improved short channel effects, it also exhibits improved drive current and subthreshold slope, since the saddle structure provides a tri-gate type of effect that helps to control the channel better. This structure does have problems with gate-drain leakage and threshold voltage, and is therefore less effective at reducing the off-state leakage. Engineers at Samsung have been able to mitigate these effects somewhat by using a recessed fin structure or RFinFET. This structure just employs the saddle structure in the bottom of the recessed structure, which lowers the gate capacitance and the off-current. This in turn, helps to improve retention time. Q: What do you think might be causing this problem seen here? Energy Dispersive X-Ray Analysis shows that there are high levels of carbon in and near the anomalies. A: Our best guess is that there was some type of contaminant in the PECVD chamber that fell onto the wafer during the dielectric deposition process right before top metal was deposited. This contaminant is a hydrocarbon material of some type (possibly a polymer from the CVD machine somewhere). During subsequent processing, it vaporized and created the "bubbling volcano" look that you see in the SEM images.